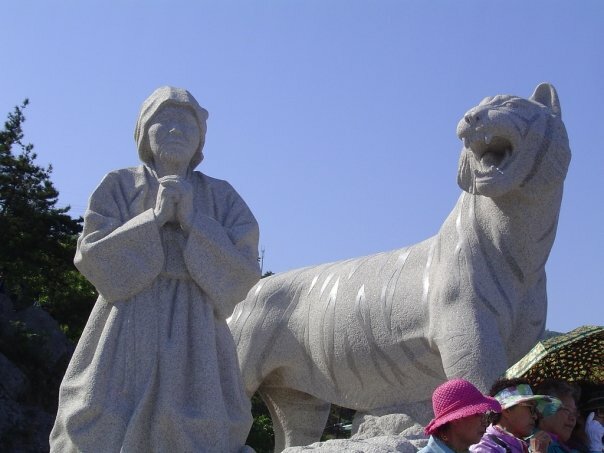 The plan for the weekend was to go down south to visit Wolchulsan in Korea’s smallest national park, then go to the Yeongdeung festival and see the statue of Grandma Bbong. There was a holiday that weekend, Children’s Day, so my friend had time off from work to hang out with me, a newly jobless person. 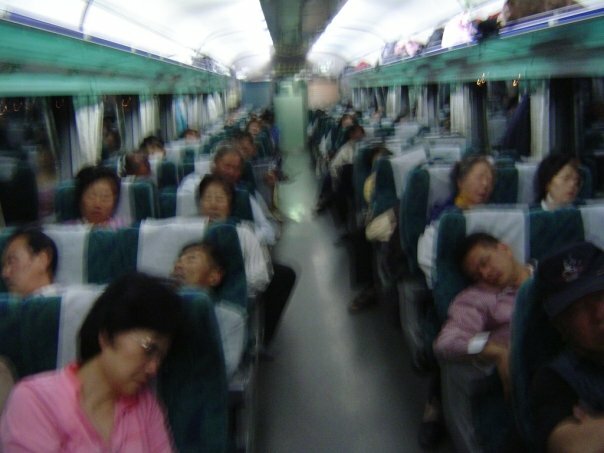 We took a train from Seoul Station that left really late at night and got to Mokpo really early in the morning. From the Mokpo train station we walked to the Mokpo bus station. It was very early in the morning and the city buses weren’t running yet. When we got to the bus station we had to wait about 45 minutes for the first long distance bus to Yeongam. Wolchulsan is an odd mountain in that, unlike all the other mountains I’ve climbed in Korea, this one had no vendors and was almost desolate. There wasn’t even one ajumma sitting on the side of the path selling beondegi. 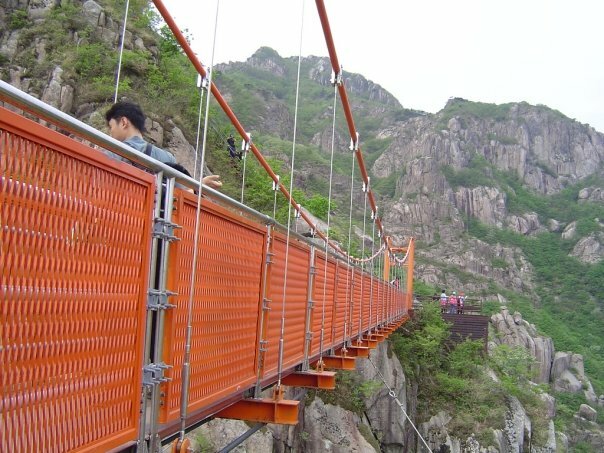 There were many peaks to climb and play on but what I was mostly interested in, was the suspension bridge, called Cloud Bridge. If you ever go to Wolchulsan for a day trip, be sure to ask when the next bus out leaves. In fact you should ask this question before you go to Wolchulsan because for some destinations there is only one bus a day. We had planned on going back to Mokpo to spend the night, but there were no more buses to Mokpo that day. The town near the mountain had nothing interesting to offer, so we went to Jindo. By the way, if you are hungry after climbing the mountain, don’t think that you’ll find somewhere nice to eat in town or at the bus station. There’s nothing decent in town and stay away from the horrible stuff they serve at the “Chinese restaurant” at the bus station. Eat at one of the places near the base of the mountain. The next day we went to the Yeongdeung (영등) or The Sea Parting Festival. At a certain time every year the tides goes out far enough that people can simply walk to the surrounding islands. There is a story behind the festival, but I won’t re-tell it; click on the link. You have no doubt clicked on the link above and have read the story. If you looked it up in a Google search you’ve probably noticed the heroine’s name differs from website to website. Let me mention something about the Korean writing called, Hangul. This writing system has only 24 letters, unlike the 26 letters we have in our Roman Alphabet. When you match up the letters of both writing systems you’ll see that there are some incongruities. The letters “F”, “P”, “Z”, “R”, “L” and “ㅡ” do not have a corresponding letter. Their letter for “F”, “ᄑ”, is really more like a “P”, but sometimes when written in English the “P” sound is represented by “ㅂ” which is actually more like our letter “B”. There is no letter for “Z”. Instead they use the letter “ㅈ” which is really more like our letter “J”. This causes many Koreans to go to the jew to see animals. The letter “ㄹ” does double duty as both “R” and “L” but it doesn’t sound distinctly enough like either letter so that the words “right” and “light” are indistinguishable when coming from a mouth of a Korean. As for the “ㅡ”. This makes a sound like… well maybe it’s like a “uu” which is never used in English. Then sometimes for no known reason at all, the letter “ㄹ” is spelled with the letter “N” in English, even though there is a separate letter “ㄴ” that is only “N”. For example the main street in downtown Seoul is spelled 종로 in Hangul and Jongro or Jongno with Roman Alphabets. Because of these discrepancies in lettering, words are often spelled one way in the Hangul system and many ways with the Roman Alphabet. Like the name of the central character in our story, Grandma Bbong/ Grandma Ppong. 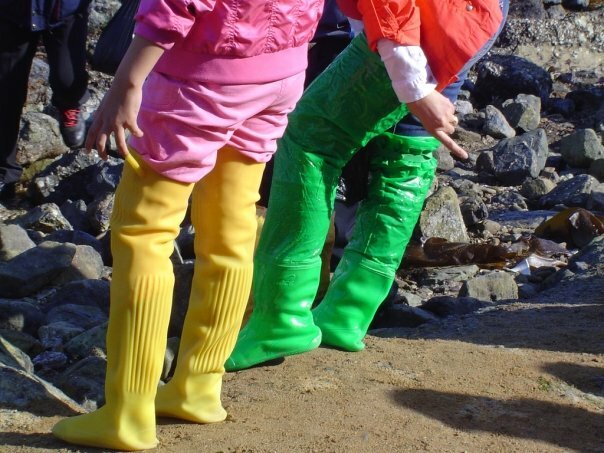 At the festival many people rented long rubber boots in which to cross the sea, while others stayed on the shore collecting sea weed. I didn’t try to rent any of the colorful boots, so I don’t know how much the fee was. What? No, I said BEACH, BEACH. It’s a nice BEACH. 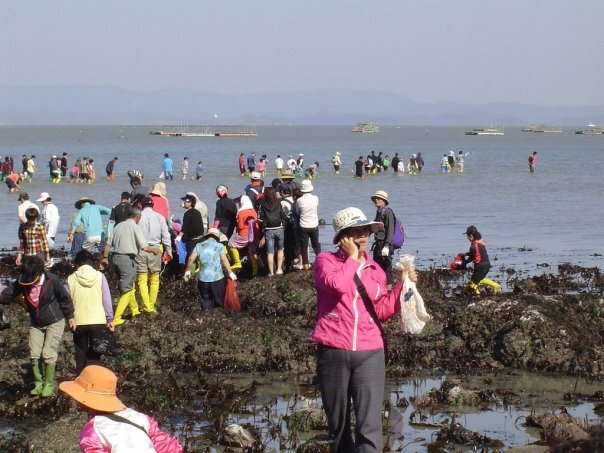 Most of the seaweed collectors where ajummas and their grandchildren who were most likely being punished. Other people stood around shouting into their cell phones, annoying all the people who came to the beach to have fun. While still others, who didn’t realize they were going to a rocky beach when they got dressed that morning, stumbled around in their high heels. Heels at the beach with knee-highs? You can take a train from Seoul Station or take one of the 7 flights per day from Seoul. This city is on one of the KTX lines. It depends on what train you take. 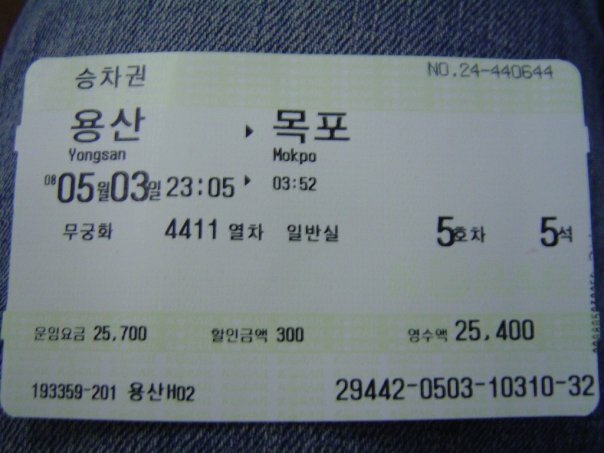 The ticket (25,700KRW) in the picture is for one of the cheaper trains. Okay, so there isn’t much to do in Mokpo itself. 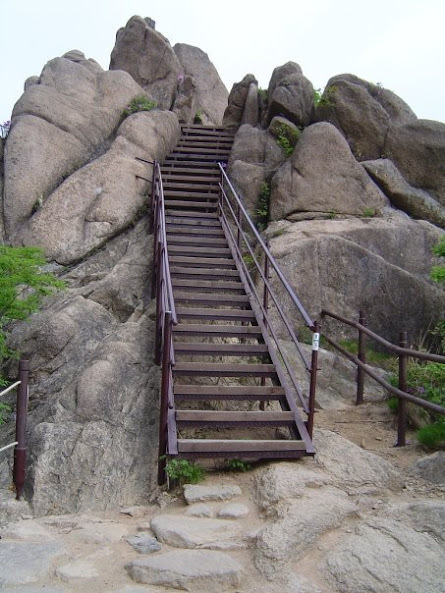 There is a mountain to hike up, but what Korean town doesn’t have a mountain? 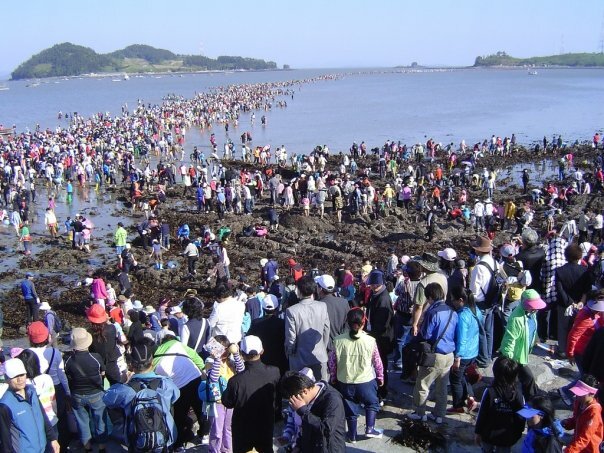 Mokpo is great because it’s near other towns that have stuff to do and you can easily get to Mokpo by KTX. There is a Gatbawi here, but don’t confuse it with the wish granting Gatbawi which is in Daegu. From Mokpo Bus Terminal take a bus to Yeongam Bus Terminal. From Yeongam Bus Terminal you can take a 5,000KRW taxi to the entrance of the park. If you show up in hiking gear, you won’t even have to tell the cabbie where to go. He’ll just assume. I think there is an entrance fee, but I showed up about half an hour before the guy who collects the money got to work. It might cost about 2,500KRW (2.50USD) to get in. 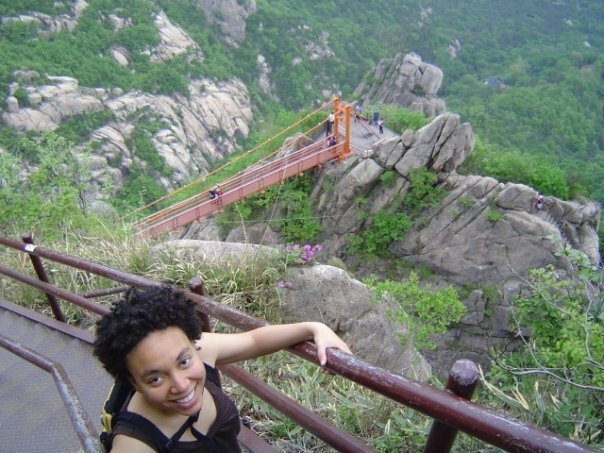 Many mountains in Korea have entrance fees, but no one to collect them. So a majority of the mountains in Korea are technically free. Make sure that you bring enough water and food to last you the day when hiking up Wolchulsan. There are no vendors at this park. If you’re hungry after your hike, eat at one of the restaurants at the base of the mountain. Don’t count on getting something at the bus station! Go to Jindo Bus Terminal. Then take a bus to Hoedong-ri (회동리). If you are a tourist traveling at the time of the festival, everyone will just assume that this is where you want to go. Even though google maps says you have to walk to the beach from Jindo bus terminal, there is a bus during the festival at least. There is a specific time when the tide is at its lowest. I think it’s around 5:something in the evening. There are tons of other stuff to see and do all day long for the 2 or 3 days that the festival lasts.